Salem Reads: One Book, One Community is a community-wide reading program encouraging people to come together through reading, discussion and programs based on the theme(s) of a common book. The project is supported by the Salem Public Library Foundation, businesses and individuals who value the role of the Library in the community. This particular book will offer an opportunity for people of diverse ages, backgrounds, viewpoints to come together to discuss compelling common issues faced by the community, and further our goal of the Library being an inviting, inclusive community center and a place to seek knowledge. 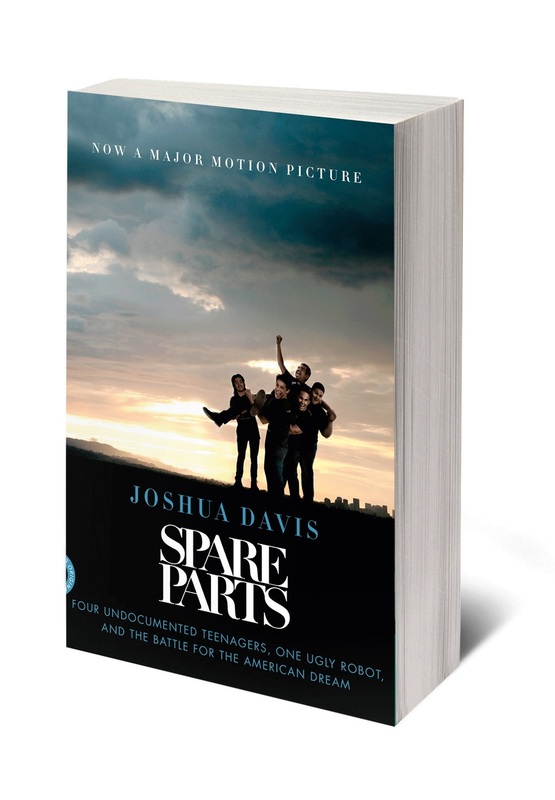 Spare Parts by Joshua Davis has been selected as the inaugural book for Salem Reads. Macmillan Publishers describe Spare Parts as the true story of four Latino teenagers who arrive at the Marine Advanced Technology Education Robotics Competition at the University of California, Santa Barbara. They were born in Mexico but raised in Phoenix, Arizona, where they attended an underfunded public high school. No one had ever suggested to Oscar, Cristian, Luis, or Lorenzo that they might amount to much, but two inspiring science teachers had convinced these impoverished, undocumented kids from the desert who had never even seen the ocean that they should try to build an underwater robot. Increase Library partnerships with community businesses and organizations. The Salem Public Library Foundation sees Salem Reads as an opportunity to increase the Library’s visibility, and act as a catalyst to bring the community together around shared values. The committee selected Spare Parts because the book has many dimensions that will lend themselves to broad community engagement. These include education, immigration, undocumented young people, robotics, education best practices and equal opportunity for young people in general. Our program is distinctive from other similar programs in Oregon in that we are targeting the participation of young people in our high schools and colleges with the goal of having a rich multi-generational experience for everyone who participates. We hope choosing Spare Parts will be a unifying element in our community which is currently 25% Latino. We feel it is particularly important to engage the entire community in conversations about issues of equal opportunity, equity, education and legal status, using Spare Parts as stimulus. One Book, One Community experience! Author event with Joshua Davis on Feb. 21st. Tickets have been distributed. If seats are not filled by 6:45pm tickets are forfeited and those waiting may get a seat. Salem Public Library Foundation is committed to this important project and will provide part-time staff, leadership and financial support. The Library’s other boards, Friends of the Library and Library Advisory Board, have pledged to support Salem Reads with volunteers and promotional efforts. Salem Public Library has also granted its support and the Library Administrator has committed staff time for all February 2017 programming to be planned around the themes of the book. Multiple copies of Spare Parts will be purchased for the Library circulation in all formats available – print, large print, audio, electronic and Spanish. Sponsorship at any level will help Salem Public Library to engage a diverse population of library users to come together to talk about important issues facing our community and society – immigration, education, and the pursuit of the American dream. More specifically, your donation will be used to purchase Spare Parts in print, Spanish, ebooks and audio books for the library collection, as well as over 500 books to be given away at the Library and other locations in January 2017. It will help us bring Joshua Davis to Salem for an evening lecture and day time presentation at a school. Sponsorships will also allow us to screen the feature film Spare Parts and documentary movie Underwater Dreams as well as provide other programming such as robotics, panel discussions, musicians and book club and high school library kits. Please consider joining us in supporting Salem Reads!